Earlier today, I started to evaluate Stainless. In this post, it’s my intention to dig a little deeper by sharing more of what you will and won’t get with Stainless. Private Browsing – On selecting “File \ New Private Browsing Window”, the Stainless browser that appears makes use of WebKit‘s private browsing mode. In this mode, global history, page caching and storing of AutoFill information are disabled. Spawned tabs and windows inherit the private-browsing mode. Single-Point-of-Entry – Obviously you can type in a URL. However, you can also type in a text string (e.g., “Google Chrome”) to initiate a search via Google. In fact, via Stainless’ “Preferences”, you can choose to make use of Google, Yahoo!, Live Search, AOL or Ask. Process Management – I alluded to the multiprocess capability of Stainless in the previous post. I’ve just realized that by selecting “Window \ Process Manager” you can monitor and even terminate processes via a simple GUI. Very nice! Downloading Capability – I tried to download from a few sites … and all attempts FAILED!! I am shocked and amazed. I saw a Page loading error: Frame load interrupted message appear in the status bar each time … This is disappointing and will hopefully be fixed in version 0.2. History – Via Stainless’ “Back” button, there is some notion of history, but that’s it. URL Caching/Auto-Completion – URL caching and auto-completion are unavailable. An Open Source Version – There’s a significant Open Source aspect to Chrome. Based on proprietary technology developed by Mesa Dynamics for their Hypercube personal-widgetsphere offering, Stainless and Open Source seem unlikely to resonate. 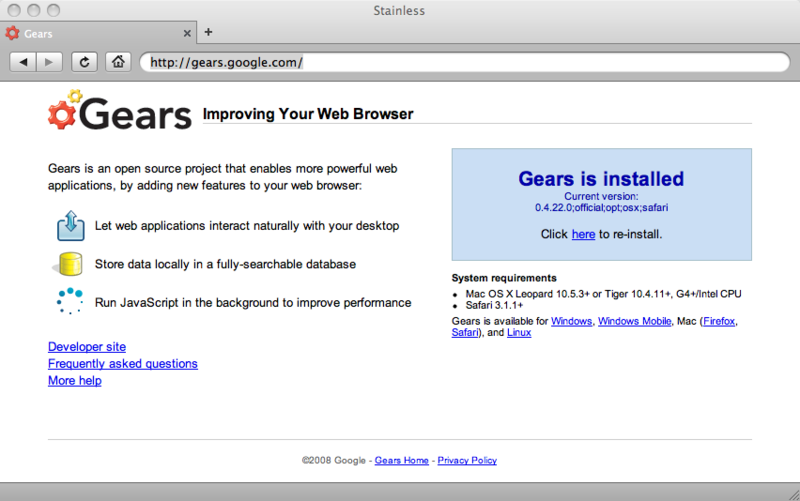 Cross-Platform Support – Stainless is available for Mac OS X Leopard. Will this offering will be broadened? Unknown. Extensibility – This killer functionality is a core competence of Mozilla Firefox. It appears that Chrome will sport something analogous. Stainless? Unknown? Offline Mode – I’m thinking of something along the lines of Google Gears … but I don’t see it arriving soon … I installed Gears for Safari. Unfortunately, Stainless gives me the impression that I have Gears support, but in reality (during an offline situation) it’s clear that I don’t. Misleading. Despite the negatives, I expect to continue to make use of Stainless, and encourage you to do the same. Feel free to chime in with your impressions.